The day after activists asked political representatives to put pressure on Israel, Mahmoud’s mother was granted a permit to see her son in the West Bank. She is currently by her son’s side at the hospital. 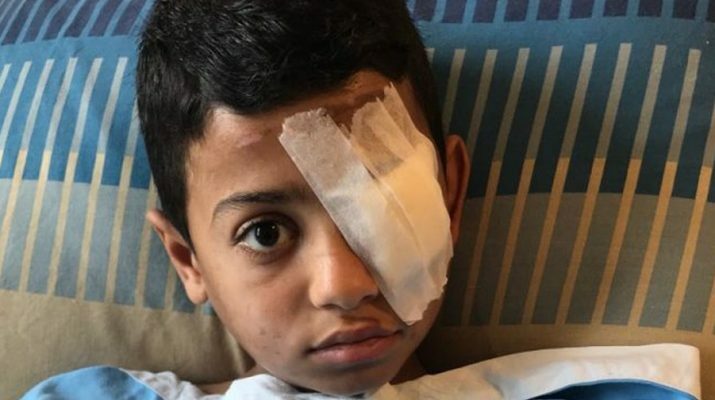 Eleven year old Mahmoud Sawalhi, from Khan Younis, Gaza, was shot in the eye and the shoulder by a sniper close to the Gaza fence on the 14th May. At first, his family believed that he had been killed, but miraculously Mahmoud survived, was transferred to a hospital in the West Bank, and is currently awaiting serious surgery in Ramallah. Israel’s brutal blockade of Gaza means that his family can not leave the Strip to visit him. Mahmoud’s mother is frantically waiting in Gaza for permission from the Israeli authorities to allow her to visit her son in hospital in the West Bank. He is being cared for by cousins in Ramallah, most of whom he had never met before his injury. His family is asking for urgent political pressure to be put on the Israeli authorities to grant his mother a permit to be with him in Ramallah. We visited Mahmoud in hospital. His cousin, Samar, spoke to us. She explained that the family was expelled from their village of Abu Shusha, within the current borders of Israel, in 1948. The family was split up – some were displaced to Gaza, and others to the West Bank, Jordan and Egypt. What happened to Mahmoud on 14th May? He was shot on the day that 63 people were killed close to the Gaza fence. There was a tent at the Great Return March doing activities for kids – it was like a festival – so Mahmoud insisted to his dad, Ashraf, that he wanted to go there. Ashraf took Mahmoud and his three brothers in a tuktuk. We think that Ashraf got lost, because he drove close to the fence at Khuza’a, in the Khan Younis area, and discovered that the Israeli snipers were shooting at them. 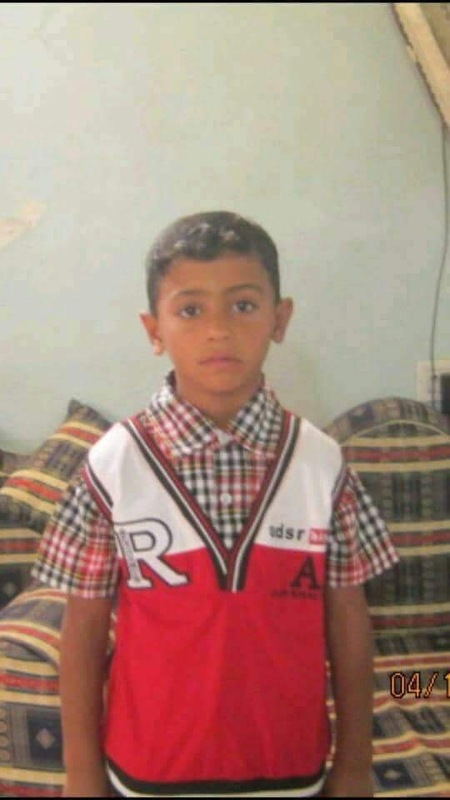 They weren’t firing warning shots – they were targeting them, and they could see that Mahmoud was just a child. Mahmoud was shot and fell off the tuktuk. Ashraf was shot in the leg, too, and didn’t realise that his son had fallen until people shouted at him. He carried Mahmoud in his arms, thinking he was dead. Mahmoud was taken in an ambulance to hospital, and during that drive his heart stopped twice. An Israeli sniper shot a bullet into his eye, which broke his skull above the eye, and then shot out the top of his head. His dad said that part of Mahmoud’s brain was in his hand. Now he doesn’t have any bone on part of the top of his head – it is only skin. According to his hospital scan he shouldn’t be alive now. Mahmoud was also shot in the shoulder by a second bullet. The first news we heard here was that Mahmoud was dead. We were then told that only his heart was working. He was in a coma for 6 days after he was shot. After he woke, the doctors removed the oxygen from his lungs to see if he responded or not. He responded well so they kept him on a machine to help him breathe. After a couple of days the family got a permit to transfer him from the hospital in Gaza to Ramallah. He arrived here on the first day of Ramadan. He wasn’t moving – he was still on machines. On the first day here he was just a body on the bed looking at us. He didn’t make signs at us at all. He couldn’t move his head or neck. Now he is much better than expected. He doesn’t speak, though, and we still don’t know how much damage has been done to his brain. The front of the brain is responsible for speaking, so we don’t know if it’s psychological trauma or whether his brain is damaged. We don’t know what has happened to his memory, although he is able to write his father, brothers’ and sisters’ names. When he stands he is not very balanced. He will have an operation in a few days’ time. How serious is it? Only his head was stitched up in Gaza, and he will have a serious operation to remove his eye. This will probably be on Sunday or Monday. This will include a few doctors – an eye surgeon, a brain surgeon and a facial surgeon for the bones in his eye. They need to do a clean cut between the damaged part of the brain and the eye. They are afraid that the good eye will be affected and become weaker and weaker because the two eyes are connected. Some of his eye-tissue has entered his brain: part of his eye is in his brain. There are some tiny fractions of damaged bone which are also in his brain. The bullet hole [in his head] is wide. The doctors told us to wait until after the operation to see exactly what has been damaged. The CT scan says that part of his brain is damaged, so we are very nervous about the operation. They are very worried about infection – it’s likely for these kinds of injuries. And it would be very bad. His tendon is also damaged from where he was shot in his shoulder. Why was he transferred from hospital in Gaza to the West Bank? The hospital in Gaza has good doctors, but was overwhelmed and Mahmoud’s case isn’t easy. The hospitals were full that day, and his relatives had to step between bodies. It was like in the movies – the corridors were full of dead and injured bodies. Coming to this hospital gave him a chance. They had too many injured people to deal with in Gaza. He is on intense medication since he has been here. Medication is a big problem in Gaza: there’s a big shortage of supplies and facilities. Can you explain why Mahmoud’s parents were not permitted to go with him to the West Bank? Mahmoud’s father is 45 years old and his mother is 43, so they’re not allowed to come to West Bank. They only give permits to people over 55 years old to accompany the wounded to hospital. One of our relatives in Gaza, who is 60 years old, came with him in the ambulance to the hospital but has now gone back to Gaza. We are working so hard to get his mother through the Erez crossing. The Israelis said that if she had any kind of political record she would be forbidden to come. Yesterday she was waiting at the crossing all day. She had a permit to cross, but at 2.30pm the Israelis said that she had to go back because she needs direct approval from Tel Aviv to cross. This was specifically because Mahmoud was injured on the Nakba demonstration. The Palestinian person who is coordinating with the Israelis has told us that they are working very hard on getting the permit. But Mahmoud’s operation is this Monday and his mother is not here. It’s not easy for people from Gaza to be in hospital in the West Bank. If Mahmoud didn’t have family here, what would he do, alone here? If he needed something, how would he get it? Do you think governments which support and supply weapons to Israel are responsible for Mahmoud’s condition? I think governments all over the world are responsible for these kids. Israel is trying new technology and weapons on the people of Gaza. But it’s not only that countries sell Israel the weapons – all governments have equipment to kill – it’s Israel’s will to kill. The will of Israeli politicians to forbid a mother to be with her eleven year old child when he is in a serious condition in hospital, this is a responsibility for all countries all over the world. In Gaza, it’s not just the killing of Palestinians that’s the problem. 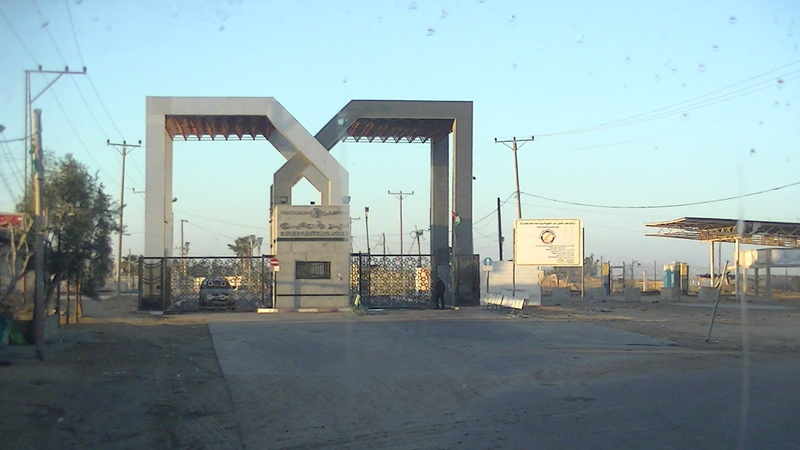 I visited Gaza with my work, and when you’re there you feel like you’re in a prison. People with BA degrees there can’t find work. There are no chances for people. There’s a 45% unemployment rate – one of the highest in the world. People can’t travel outside. Sometimes there is no food. If your kid is injured you might not find medicine. You’re not living – you’re just surviving. People will just remember the dead and injured of the Great Return March as numbers. Just statistics. But they’re not only numbers. Samar is asking people internationally to urgently contact their political representatives to put pressure on the Israeli government to allow Mahmoud’s mother, Feda Sawalhi, to come to the West Bank to be with him in hospital. You can contact your Member of Parliament, or other political representative, and ask them to pressure the Israeli authorities through your country’s embassy in Israel.